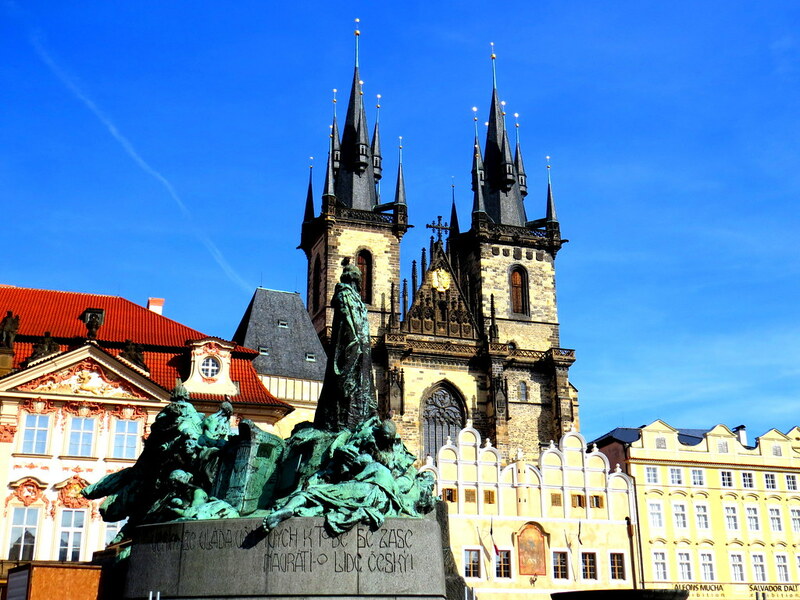 One of Prague’s most visited sites is the Old Town Square, in the centre of town. 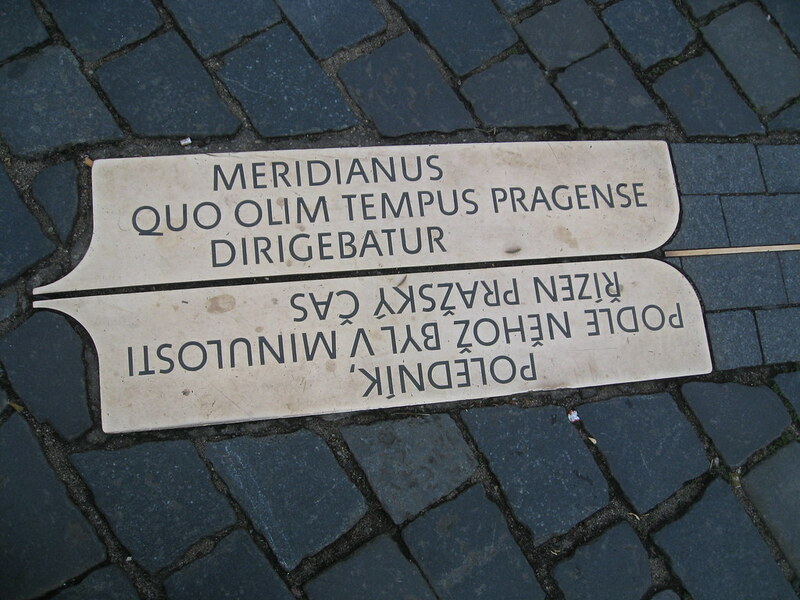 In this one square, you’ll find some of Bohemia’s most famous buildings. There is something here for art lovers, historians and foodies alike. 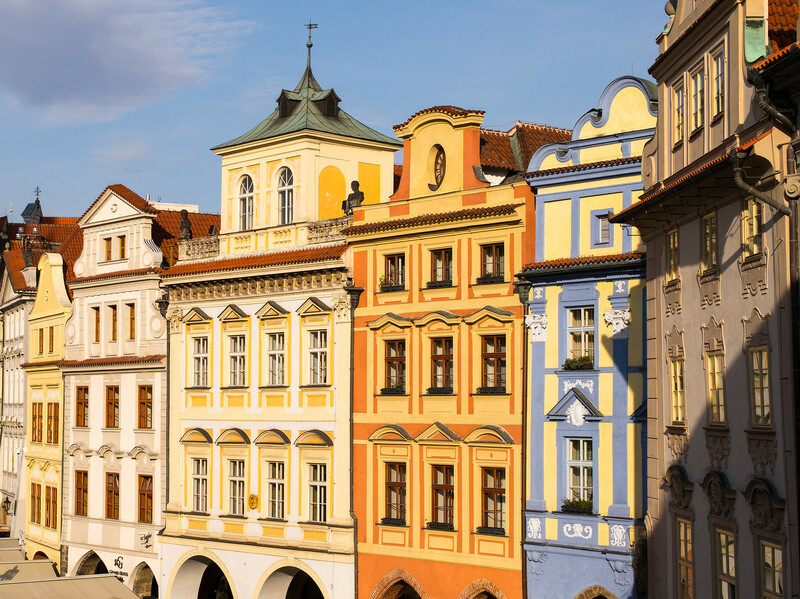 The plaza is over 1.7 hectares large with a sprawling history detailing Prague's gruesome and glorious past. Rotating minstrels still entertain on-lookers, and the square often continues to serve as a place of political protest for locals to give voice to their concerns. Standing in the centre of the square, make a 360° spin to get your bearings and decide on which buildings you might want to take a closer look at or even head inside. The most imposing building is, without a doubt, the Gothic Church of Our Lady before Týn. The distinctive twin black Gothic spires loom over the Týn Courtyard and can be seen all across Prague. The main facade is hidden from the central square by a row of pastel arcade houses which sit nestled under its shadow. In the 11th century, a large Romanesque church once stood on this site. It was commissioned by the foreign merchants who sold their goods in the Týn Courtyard. The Týn Courtyard still stands today, and you can visit all different merchants and their shops who sell traditional Czech wares. Tyn Church was dubbed “Cathedral of aristocrats” since the merchants who funded the church's construction were wealthy and wanted a church all of their own. They desired their new building to rival St. Vitus Cathedral on the other river bank inside Prague Castle. Although personally I don't believe it does, they sure made a good attempt. Construction began as early as 1256 when High Gothic architecture was in its prime. The soaring vertical columns and towers were inspired by St. Vitus Cathedral built by Matthias of Arras. The two towers which make Church of our Lady so iconic are about 80 meters tall, but they are not symmetrical. 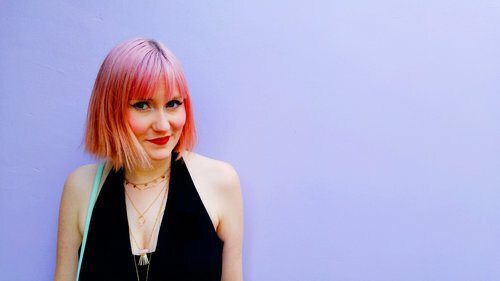 One, named "Adam", is larger than the other, called "Eve". Between the two towers, is a small, pitched roof. 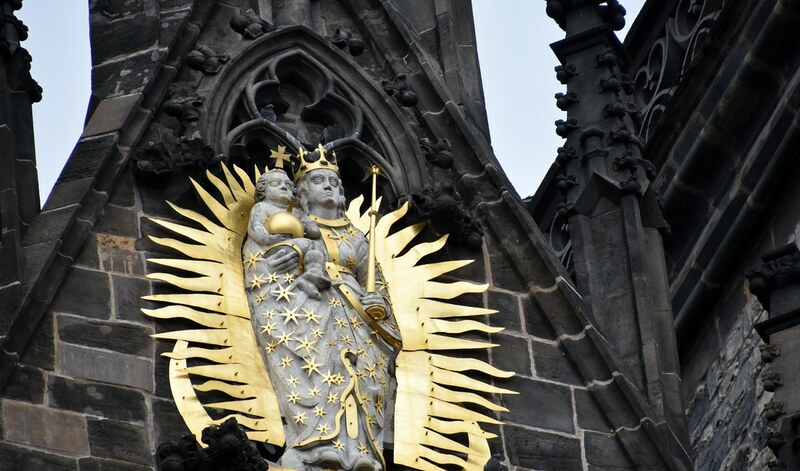 Inlaid on the roof is a golden statue of the "Virgin Mary.". In one hand she is holding baby Jesus and with the other a sceptre. The child holds in his arms a sphere, symbolising holding the world in his hand. But this is not just any golden statue. 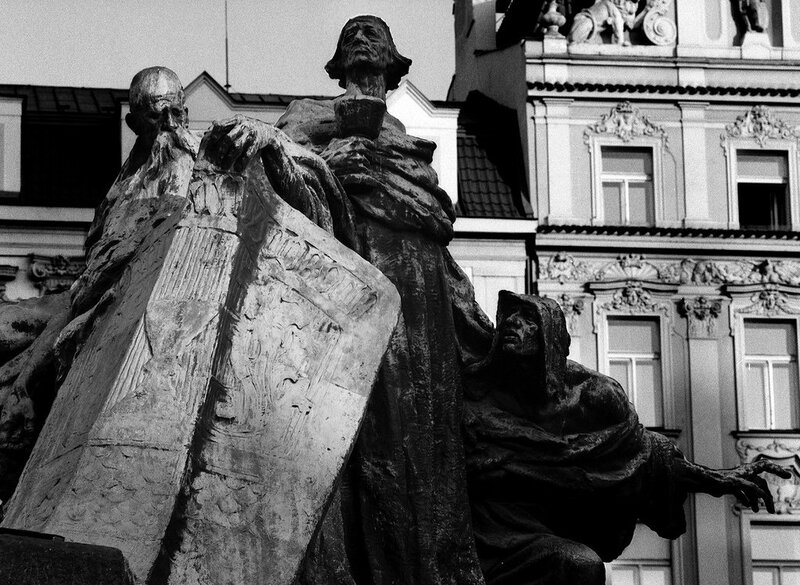 When the Hussites gained control of Prague, King George - the Hussite King - had a giant statue of himself created and erected between the two towers. After the Thirty Years' War between the Bohemians and the Holy Roman Emperor, when the Hussites were defeated, the old statue was melted down to make the new one of the Virgin Mary. While the exterior is gothic, the interior was renovated in the 17th century and is a Baroque gem. Golden frames, with richly drawn saints, adorn the columns. 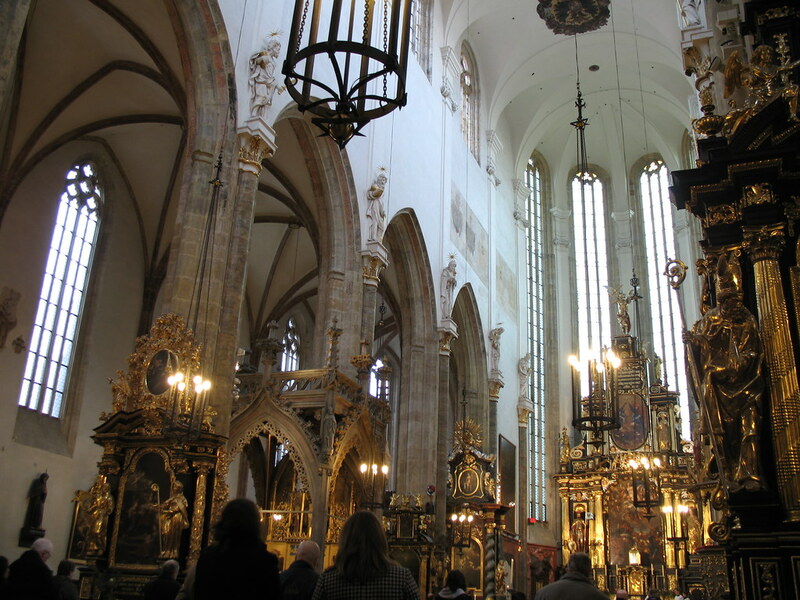 In the centre of the nave is the elegant altar surrounded by jewel toned painting by Karel Škréta. One of the most famous things to see inside is the tomb of the astronomer Tycho Brahe. He was a Danish astronomer, and court scientist for Rudolf II and his marble tombs portrays a cartoon effigy of himself. 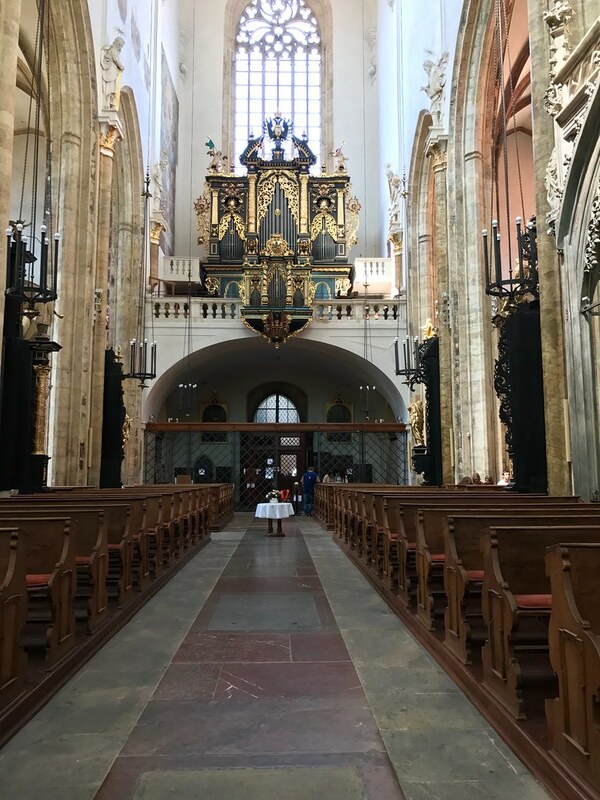 The dominating, gold organ inside is the oldest organ in Prague and dates all the way back to 1673. Walking south of the Church, head towards the Old Town Hall. As you go, you'll pass a small grouping of the most elegant houses which make up the "Little Square". Since the square is a pedestrian only area of the city, you can stroll at your leisure, taking time to look up at all the multicoloured, pastel residences lining the route. Every architectural style can be found here. One of the most notable buildings is the "Štorch House". A renaissance building with a painting of St. Wenceslas 'At the Stone Table' etched onto the front is one of the most elaborate designs which catches your eye. On the first floor of many of these building, you'll find various cafes and restaurants. Many of the pubs bear names like 'At the Golden Unicorn', 'At the Stone Ram', 'At the Red Fox' and 'At the Blue Star'. Since there were no house numbers in the early 17th century, the residents installed signs or plaques with an identifiable character or animal on them to identify which house was theirs. The "Minute House" was purchased in 1896. 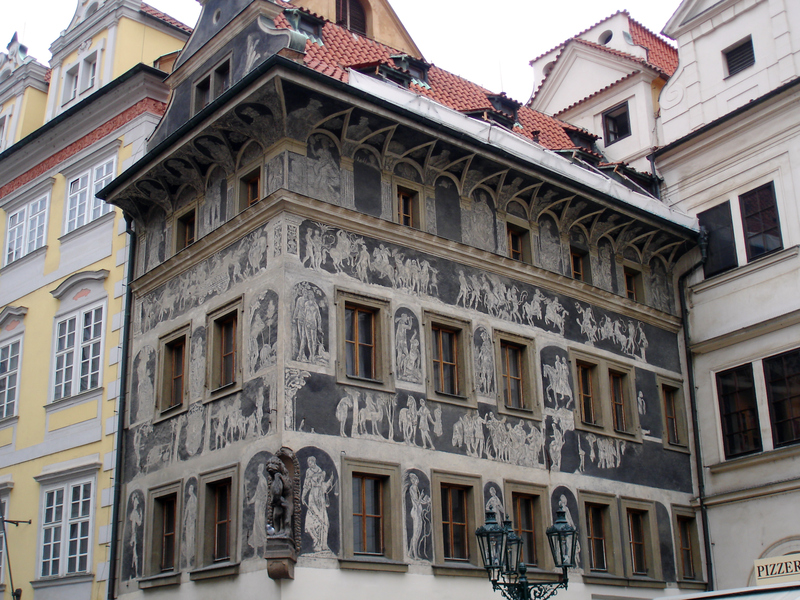 It was a Gothic house from the 15th century, and the exterior is decorated with series of sgraffito designs representing classical and biblical themes. Sgraffito is a form of decoration made by scratching through a surface to reveal a lower layer of a contrasting colour (in this case black and white) typically done in plaster or stucco on walls. The Gothic stone portal is one of the last original aspects of the town hall standing today and serves as the main entrance. The Astronomical Clock (or Prague Orloj) is one of Prague's BIGGEST attractions, or at least that's what the hoards of people crowding around it would make you believe. The clock is housed on the southern wall of the Old Town Hall and has been there, in part, since 1410. Legend says that if something bad were to befall the clock, Prague itself would fall. Although it is just a superstitious rumour, it's been enough to keep the clock well protected and preserved after all these years. There are three main parts to the clock. The first is the Dial, which represents the Sun and Moon and their position in the sky. The next is the Sculptures of the Apostles who, upon the hour, perform a little show for the onlookers. They spin around the clock, chased by a statue of death. This is what everyone is waiting to see but let me tell you, this little show isn't worth fighting your way through the mob. Once the show is over, the crowds disappear, and you get a much better view of the clock itself. The final part is the Calendar Dial. It is surrounded by different medallions representing the various months of the year and their corresponding astrological signs. The Church of Saint Nicholas sits behind the Town Hall. 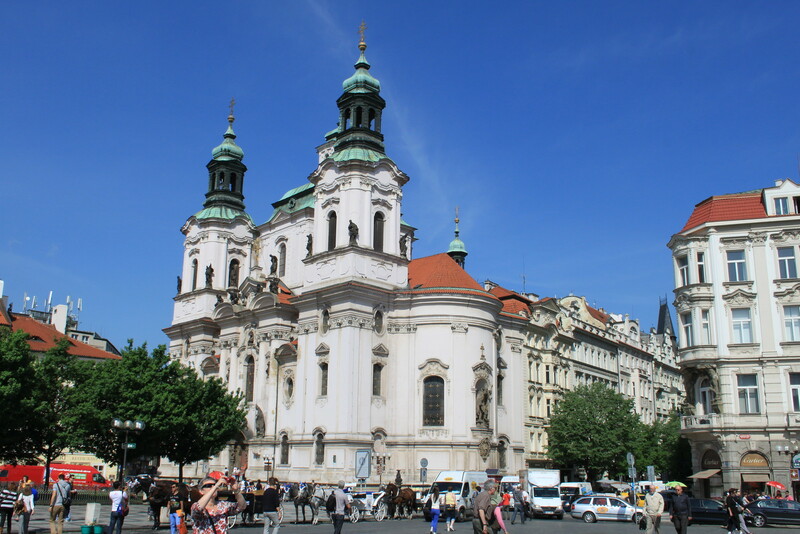 It's large green topped towers sit atop the pristine white, Baroque church facade. 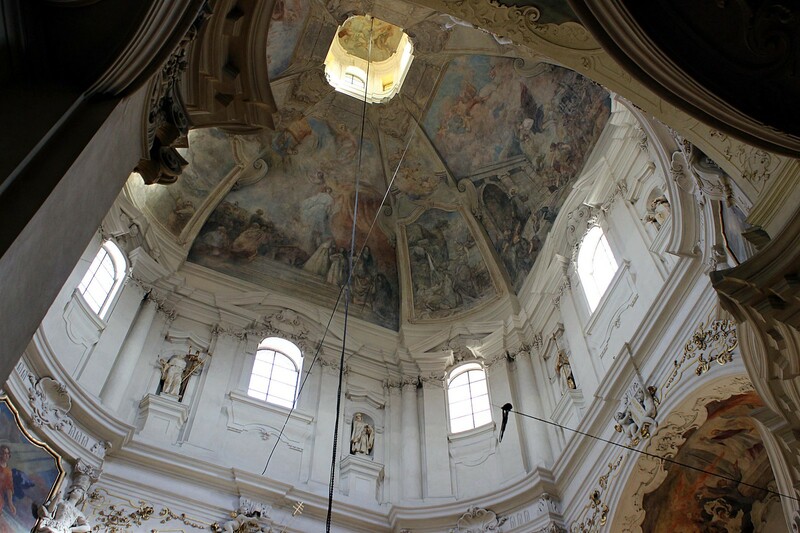 The church was built in 1732, and it's interior hosts a lovely array of baroque frescos and sculptures.